Here are the stories of 5 students who left Quinnipiac and transferred to other schools. Students transfer for a variety of reasons. This is Mike’s story. Quinnipiac University is concerned with their own dropping retention rate, but Connecticut actually has a retention rate higher than the national average. 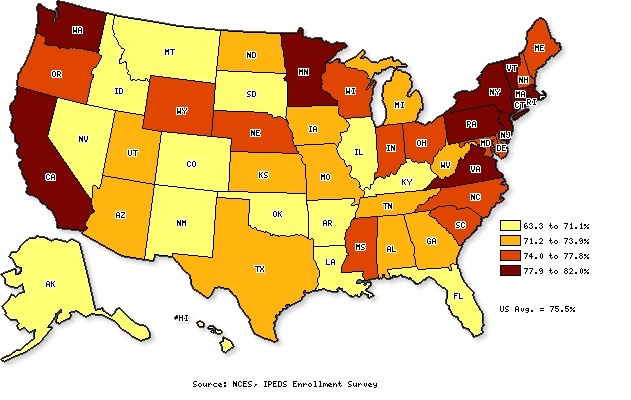 This map is very useful to educators and administrators who are looking at national and regional trends regarding four-year college retention. The Integrated Postsecondary Education Data System, or IPEDS, collects data from colleges and universities across the country to analyze issues such as retention. IPEDS is sponsored by the National Center for Education Statistics, a US government organization. Quinnipiac’s Department of Residential Life supports and educates students in hopes of keeping them safe and content while at school. The idea is that if students are happy while living in the residence halls they will have an easier time managing academics and will continue attend school here. Jenn Crane is the Associate Director of Residential Education. Part of her job is to oversee the programs taking place on campus – programs that are intended to keep students coming back for more. But residential programs and education have no effect on whether a student drops out, if they are dropping out for financial reasons. Financial issues are a strong force driving students out of QU. In a drowning economy, many students find themselves unable to afford the high tuition. To be a full-time student and resident at Quinnipiac for one year costs almost $47,000. Students can fill out a FAFSA form online to receive financial aid, but even that is not always enough to keep students at Quinnipiac. 70% of QU students receive some kind of financial aid, but the amount can range from $100 scholarships to $40,000+ scholarships. Podcaster Christopher S. Penn of the Financial Aid Podcast discusses the retention of students and how financial aid administrators can help.